On October 31, 2018, the French Defense Procurement Agency (DGA) officially qualified the so-called “Rafale F3-R,” the new Standard for the Rafale omnirole combat aircraft. This successful and tremendous achievement was completed on time, on budget, and in full compliance with contractual performance. All the 144 Rafale aircraft currently in service in the French Air Force and in the French Navy (as of November 14, 2018) will be upgraded to this new “F3-R” Standard and the first ten aircraft will be delivered (four by the end of this year) to the warfighters for further operational evaluation. On December 30, 2013, the DGA awarded to French industry a nearly €1 billion contract for the development and integration of the Rafale F3-R. The Rafale program is evolving through the development and the implementation of successive “Standards”, each of them bringing improved performance and additional capabilities to the Rafale omnirole combat aircraft, in order to match perfectly the evolution of the operational requirements from the warfighters. Accordingly, the new “F3-R” Standard contains important software and hardware evolutions and adds three new major and genuinely game-changing capabilities to the Rafale. The first major “F3-R” capability is the full integration of the Beyond Visual Range Air-to-Air Missile (BVRAAM) MBDA “Meteor”. Thanks to the extended range capability of the RBE2 AESA (Active Electronically-Scanned Array) radar (noteworthy is the fact that the Rafale is the only European combat aircraft in operational service to incorporate today the cutting-edge “AESA” radar technology), the Rafale equipped with the Meteor is able to intercept targets at very long range, when the MICA (RF/IR) missile complements this truly impressive air-to-air capability, both for combat interception and self-defense. Indeed, the “RBE2 AESA radar-Meteor BVRAAM” combination maintains the Rafale at the forefront of modern air combat. 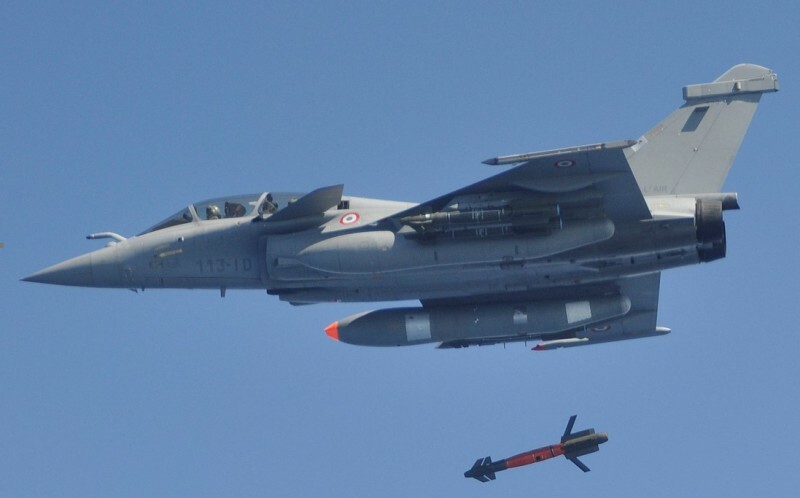 On April 6, 2017, teams from the DGA, Dassault Aviation, MBDA and Thales successfully completed the final guided firing (integration flight test) of the Meteor long-range air-to-air missile against an aerial target from a Rafale. This fifth, global, firing completed the full integration flight testing campaign of the Meteor air-to-air missile onto the Rafale. Since the first test on April 28, 2015, this campaign, conducted smoothly and uneventfully, demonstrated and confirmed better performance than those expected at the inception of the program. All the functionalities were successfully tested (such as the activation of the data-link between the Rafale and the missile) in many aircraft flight conditions (speed, load factor) and electronic warfare environments. The second major “F3-R” capability is the integration of the new-generation “TALIOS” (TArgeting Long-range Identification Optronic System) laser targeting pod. Designed by Thales, TALIOS is the first optronic targeting pod to cover the entire decision chain, from intelligence gathering through to neutralization. With the latest-generation high-resolution infrared and electro-optical sensors, line-of-sight stabilization, and high-performance image processing, its capabilities range from deep strike with precision-guided munitions to air-to-air target identification and close air support, both in daytime and by night. In short, the TALIOS pod features cutting-edge capabilities in target detection, recognition and identification, by day and night, primarily for high-precision air-to-ground strikes. The third major “F3-R” capability is the full integration, onto the Rafale, of the Safran AASM “HAMMER” air-to-ground modular weapon in its laser terminal guidance version (NATO designation: SBU-54). The AASM SBU-54 “HAMMER” is capable of engaging moving land targets, or high-speed agile marine targets, with metric accuracy, especially during opportunity strikes, as proven during recent conflicts. The Rafale is an extremely effective new-generation, combat proven (Afghanistan, Libya, Mali, Central African Republic, Iraq, and Syria; more than 30,000 flying hours in combat operations have been completed so far by the Rafale fleet) omnirole tactical fighter, but development is continuing apace to exploit more and more of the aircraft’s tremendous capabilities, and to seamlessly add new ones. 3. As of November 14, 2018, 151 production aircraft have been delivered to the French warfighters (46 Rafales M for the Navy; 48 Rafales C and 57 Rafales B for the Air Force) and 20 Rafales have been delivered to the Egyptian Air Force. -- in-flight refuelling (“buddy-buddy” tanker capability for the Rafale M).